Root Change is excited to launch Pando, an online platform that makes it possible to visualize, learn from, and engage with the systems where you work. Pando harnesses the power of network maps and feedback surveys to help organizations strengthen systems and improve their impact. Grounded in social network analysis, Pando uses web-based relationship surveys to identify diverse organizations within a system and track relationships in real time. The platform automatically-generates a network map that visualizes the organizations and relationships within a system. Data filters and analysis tools help uncover key actors, areas of collaboration, and network structures and dynamics. Pando is integrated with Keystone Accountability’s Feedback Commons, an online tool that gives map administrators the ability to collect and analyze feedback about levels of trust and relationship quality among map participants. The combined power of network maps and feedback surveys helps create a holistic understanding of the system of organizations, facilitate dialogue, and track change over time as actors work together to strengthen the system. Earlier this year, Root Change debuted Pando at the MERL Tech conference in Washington, DC. 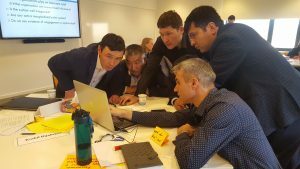 Our team has been developing and testing Pando for the past year, but the concept of a systems analysis tool for social impact organizations is 15 years in the making. In 2002, Root Change co-founder Evan Bloom came across a New York Times article about the U.S. military’s use of social network analysis to understand terrorist networks. The article sparked an idea: Could we use social network analysis to facilitate collaboration among organizations and institutions working to create impact? The following year, using software saved on a floppy disk, Evan’s team mapped networks of capacity building service providers in Ecuador and Zambia as part of an action research project with the USAID Office of Private and Voluntary Cooperation. Since then, Root Change has worked with groups of organizations around the world to use social network analysis to unearth preexisting relationships, identify influential actors, surface structural network roadblocks, and carry out activities to build trust and increase coordination. Facilitating Sector Coordination in Latin America: In 2012, Root Change launched the Global Impact Investment Map (GIIMAP) in collaboration with Aspen Network of Development Entrepreneurs in Mexico, Nicaragua, Guatemala, and El Salvador. Mapping relationships within the impact investment sector facilitated greater collaboration among investors, social entrepreneurs, and support organizations. Supporting Collective Impact in Nigeria: Network mapping has also been used in the USAID funded Strengthening Advocacy and Civic Engagement (SACE) project in Nigeria. Over five years, more than 1,300 organizations and 2,000 relationships across 17 advocacy issue areas were identified and tracked. Nigerian organizations used the map to form meaningful partnerships, set common agendas, coordinate strategies, and hold the government accountable. Informing Project Design in Kenya: Root Change and the Aga Khan Foundation (AKF) collected relationship data from hundreds of youth and organizations supporting youth opportunities in coastal Kenya. Analysis revealed gaps in expertise within the system, and opportunities to improve relationships among organizations and youth. These insights helped inform AKF’s program design, and ongoing mapping will be used to monitor system change. Tracking Local Ownership: This year, under USAID Local Works, Root Change is working with USAID missions to measure local ownership of development initiatives using newly designed localization metrics on Pando. 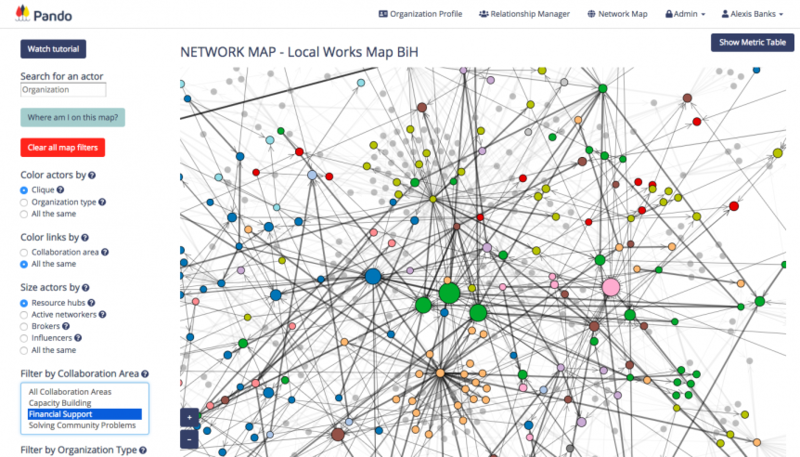 USAID in Bosnia and Herzegovina (BiH) launched a national Local Works map, identifying over 1,000 organizations working together on community development. Root Change and USAID BiH are exploring a pilot to use this map to continue to collect data and track localization metrics and train a local organization to support with this process. Pando is the culmination of more than a decade of experience providing training and coaching on the use social network analysis and feedback surveys to design, monitor, and evaluate systems change initiatives. Initial feedback from international and local NGOs, governments, community-based organizations, and more is promising. But don’t take our word for it. We want to hear from you about ways that Pando could be useful in your social impact work. Contact us for a Pando demo, or to learn more about our subscription packages and our systems thinking training, coaching, and consulting services. Learn more at www.mypando.org.